Bobbi Cordano and Nyle DiMarco recently represented the ASL Deaf community at the White House Correspondents’ Dinner. I was surprised to see Bobbi in a glamorous dress as she usually wears a practical suit. 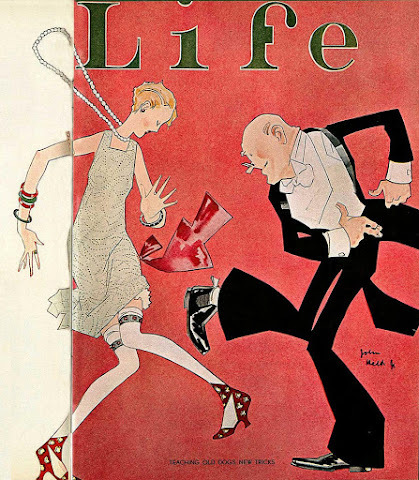 The event reminded me of a famous Life Magazine cover by John Held, Jr. If time allows, I may even do a color version! Description: Pencil drawing. At left, Gallaudet University President Bobbi Cordano with short hair and a flowing evening gown. At right, Nyle DiMarco in a tuxedo with his hair slicked back. They are dancing the Charleston, with their elbows and knees akimbo. Bobbi’s shawl trails behind her. ASL text at bottom identifies Bobbi and Nyle, along with a link to AdreanClark.com (the artist). See this image on Facebook and Instagram. Want an 8×11-inch print of the "Nyle and Bobbi's Victory Dance" illustration? It's $20 plus $7 shipping. 20% of the purchase price will be donated to LEAD-K. Buy via paypal.me/adrean Description: The Nyle and Bobbi artwork slowly appears out of a printer. It is nicely framed on the paper with text at bottom – "Adrean Clark, Nyle and Bobbi's Victory Dance, Pencil Illustration, 2016, After John Held, Jr., adreanaline.com"